I thought it would be an easy challenge to just pick few a few beads that have been sitting too long and make something. Boy was I ever naive. There is a reason I haven’t used these beads. They aren’t ready. They haven’t spoken to me yet. Ok time to get to work. I looked at a strand of Blond Onyx that I purchased from an Afghan vendor. He always has the most beautiful stones, not to mention that I covet his Roman Glass but that is a story for another time. These stones are so smooth and beautiful. The more you handle them the smoother they become. They remind me of river rocks. 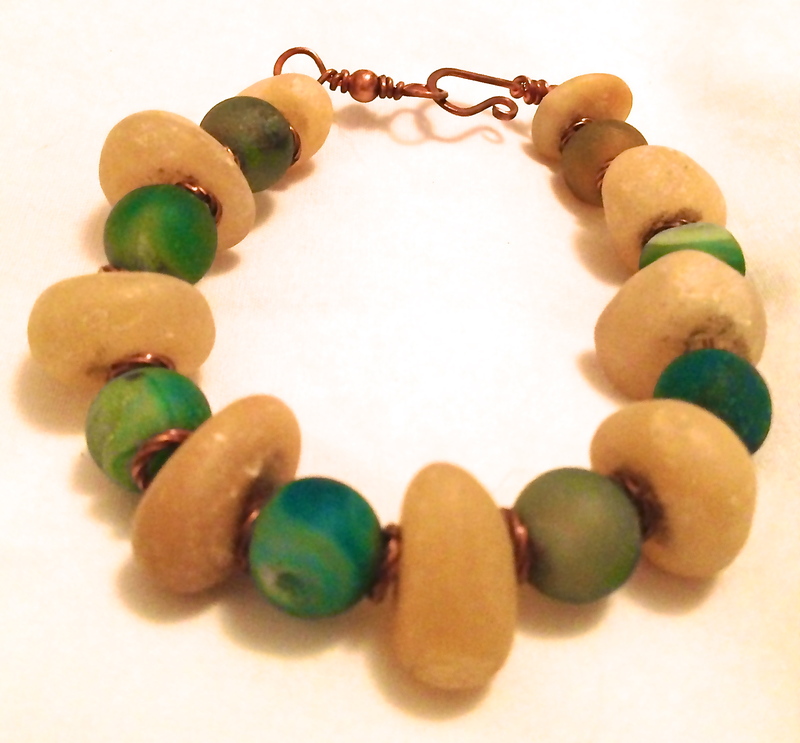 i paired them with some beautiful sea green agates and copper. I made a bracelet and a pair of earrings as well. The necklace is a bit heavy so accessories are not need when wearing it. I hope you like it. I call it Sand and Surf Crop Circles. My heartfelt thanks go out to the Hostess of this Blog Hop..Lori McDaniel Anderson. She continues to amaze me. Thank you so much Lori.Please visit her on Face Book at https://www.facebook.com/LoriAndersonDesigns . This entry was posted in Bead Hoarders Blog Hop. Bookmark the permalink. What a pretty set of jewellery! I really like the colour combo you chose. Very wearable pieces and they would certainly perk up any outfit. I enjoy wearing it. Someone called it my Flintstone’s necklace. lol. I love the colour combination. Absolutely gorgeous! You are so kind. Thanks. I love the Blond Onyx. love those beads, they have a real tactile quality. Love both the designs they capture the quality of the beads perfectly. Very nice!! Love the colors, and would also love the tactile quality. I’d spend my whole time wearing them….feeling them LOL. So pretty, I just love the colors. 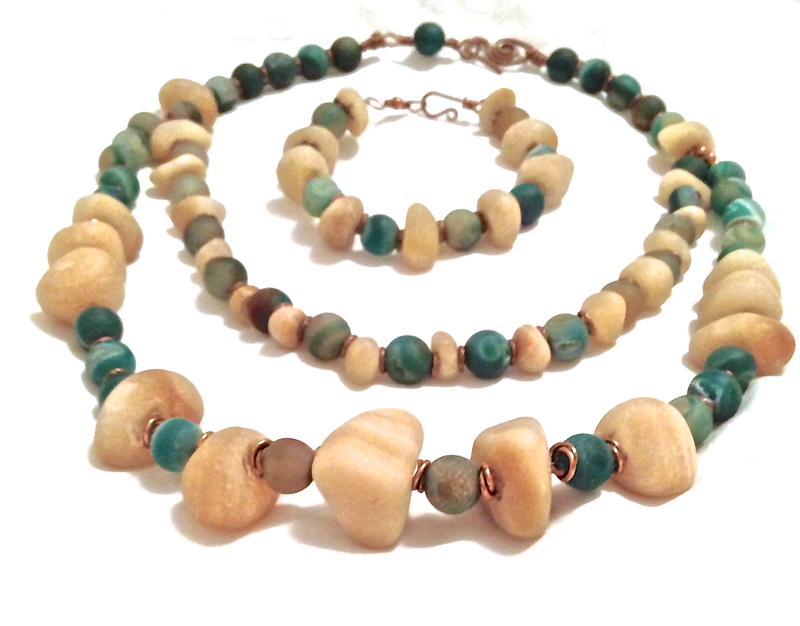 Flintstones or not, that is one gorgeous set, and the color combination is so fresh and refreshing. Marlene you are so kind. Thank you. Oh yummy! I love your description of it. . .of how it feels. It makes me want to touch this set. You have a way with words, and with design. Lovely! They really do feel good. Wish I could add moss to them. :0 Thank You. Gorgeous set, love the colors. So lovely ! Those colors would have driven me to madness, I think. These are awesome, Susan… organic and elegant at the same time! Sand and Surf Crop Circles, what a great name, so well chosen 🙂 I would wear them with black! ♥♥♥ it!!! Dini, Thanks. I wear them with jeans too!! Just lovely! The color combination is gorgeous–I think you did a fantastic job! I love how river rock feels in your hands 🙂 These must feel glorious! Dana, They really do feel good to the touch. Good job using some of your hoarded beads in your jewelry set. I like the colors you chose. Beautiful colours and sooooo very touchable. Love that necklace! The colors are great. Nice work! 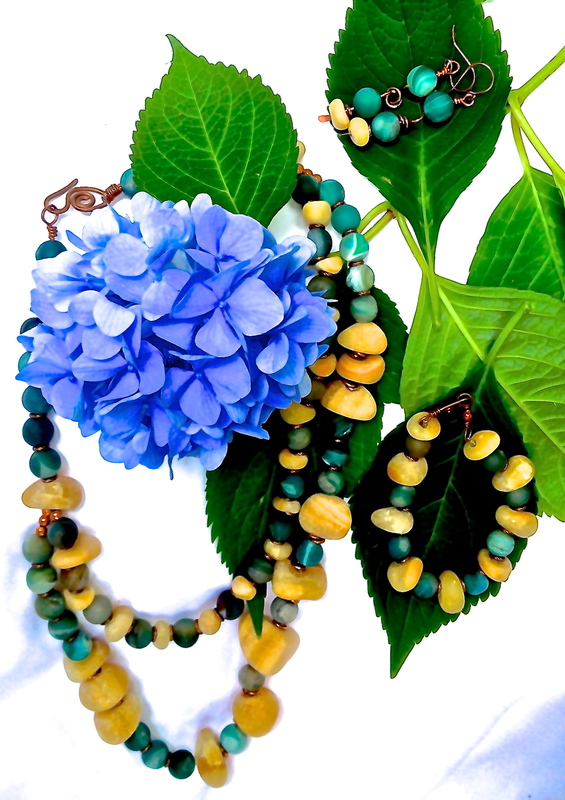 Beautiful pieces, love the beads and the way you put them together.. Thank you so much. I had a great time making them.